Made in China from fine ceramic, this cherry blossom bowl is perfect for storing away leftovers in the fridge and taking to work the next day. Featuring the well-loved cherry blossom, this cherry blossom bowl has a mostly smooth and glossy texture all around the bowl. The small cherry blossom outlines in white however are unglazed and expose the natural ceramic the bowl was made from, giving this beautifully detailed bowl a unique texture on the designs. 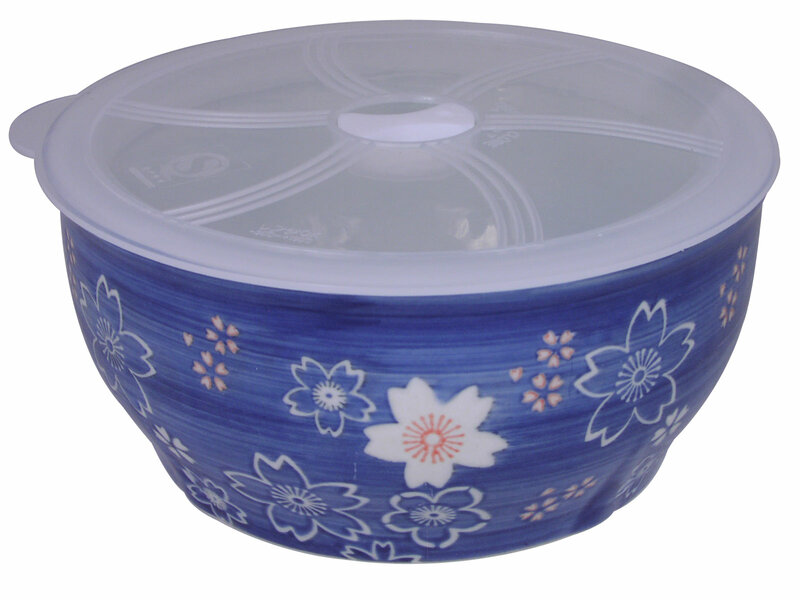 While mostly blue and white, this bowl with lid also has light pink colors to accentuate the cherry blossom designs. Microwave and dishwasher safe, this cherry blossom bowl also comes with an airtight plastic lid that can steam food as well. In the center of the plastic lid is a small switch to where you can allow steam to escape to steam your food or have it closed shut for storing. Packaged in a paper box.